South African President Jacob Zuma has decided to skip the upcoming European Union-Africa summit in Brussels after the controversy over the invitation list of the EU. 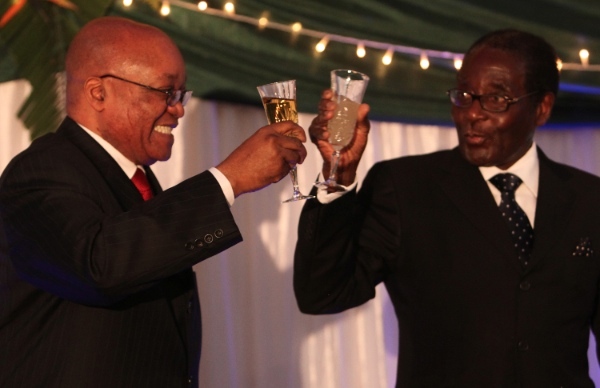 Zuma has joined the chorus of many in the African Union, including Zimbabwean President Robert Mugabe, to shun the summit for failing to invite many African leaders. “I think that time must pass wherein we are looked as subjects, we are told who must come, who must not come, we have not attempted to decide when we meet Europe; who must come and who must not come. It is wrong and causes this unnecessary unpleasantness. I thought the AU and EU are equal organisations representing two continents but there is not a single one of them who must decide for others,” Zuma was quoted by the South African state broadcaster. He has decided not to attend the summit citing “other commitments”, the South African Foreign Ministry confirmed to The BRICS Post. The invitation for the summit to be held on Tuesday and Wednesday had omitted Sudan and the Sahrawi Arab Democratic Republic, while the nod was given for Egypt which has been suspended by the African Union. Sudanese President Omar al-Bashir is wanted by the International Criminal Court for war crimes. South Africa has announced that Foreign Minister Maite Nkoana-Mashabane will represent Africa’s biggest economy at the event. EU and African leaders are scheduled to discuss “peace, security, investment, climate change and migration”, according to a statement on the EU website. Previous summits took place in Cairo (2000), Lisbon (2007) and Tripoli (2010). After 10 years of negotiations, policymakers on both sides are worried about reviving a flagging relationship even as African nations have turned to boosting south-south cooperation and ties with emerging economies including the BRICS. By 2020, commerce between developing and emerging nations in the south will account for one-third of global trade, according to the WTO. South African President Jacob Zuma said last month that BRICS are the new partners of the African continent. “South Africa can lobby the group to base a planned development bank on the continent, which would be impossible with Western partners,” Zuma said in an interview to CNBC Africa. “We welcome foreign direct investment (FDI), we are not discriminating…We’ve taken money from Germany, the U.K. the United States – why was it not a story, why is it a story when the Chinese do so?” Zuma said. “The countries that have been dealing with us before, particularly old economies, they’ve dealt with us as former subjects, as former colonial subjects,” Zuma said.